Highlights from West Ham's 4-3 win against Huddersfield in the Premier League. The 27-year-old, who left Arsenal last summer, has not played for the Hammers since December 1 with an ankle injury and it was feared the problem could rule him out of action until next season. But Wilshere has provided a boost to West Ham supporters and their manager Manuel Pellegrini and he hopes he can have an impact before the season is over. "That is the plan. I am back in full training - it has been a long time, frustrating but it was something I had to do after speaking to the specialists," Wilshire told Sky Sports News at NCF Elites, which provides sessions for kids overlooked by club academies. Wilshere was keen to praise Pellegrini, who has steered the club into contention for a seventh-place Premier League finish and the potential for Europa League qualification - highlighting the change in mood around the London Stadium. 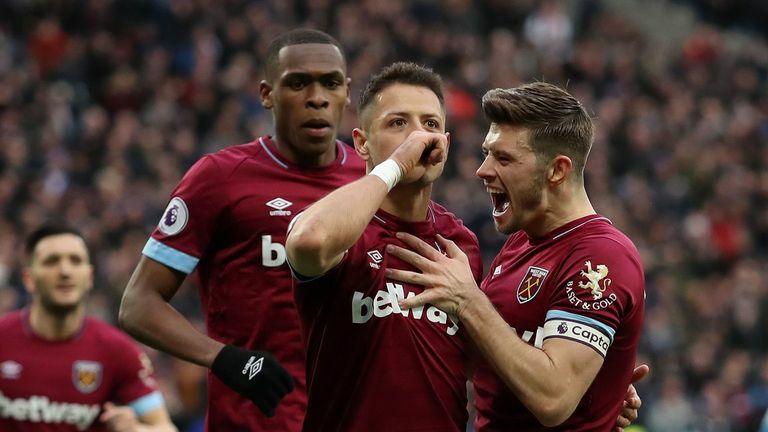 West Ham lost their first four league games but Wilshere says the confidence has long since returned to the squad and he believes the stadium deserves to host European football. "I think it was always going to be difficult because of last season, it wasn't a great season for West Ham," Wilshere said. England began their European Qualifiers with an emphatic 5-0 win against Czech Republic at Wembley Stadium and WIlshere says he isn't thinking of a return to the international scene for now. He added: "At the moment I am just concentrating on getting back [for West Ham]. I have been out for a long time - I haven't been in an England squad for a long time. "And I need to get back playing, back to my best and then you never know."